The ancient Egyptian Goddess Amentet (also known as Ament, Amentit, Imentet and Imentit) was the consort of Aken (the ferryman of the dead). Her name means “She of the west”. This was not just a geographical statement, although some scholars consider that she originated from Libya (west of Egypt). As the sun set in the west, it was associated with death and the netherworld. The name Amentet referred to both the west bank of the Nile and to the world of the dead, and the dead were sometimes known as “westerners”. Originally, Amenti (or Amentet) was considered to be the place where the sun set at the entrance to the netherworld, but the name was soon applied to cemeteries and tombs across Egypt. As a goddess of the dead, Amentet is thought to have lived in a tree at the edge of the desert overlooking the gates to the underworld. She was often depicted in tombs and coffins, protecting the dead. However, she was also a fertility goddess. She met the souls of the recently deceased and offered them bread and water before ushering them into the realm of the dead. This sustenance revitalised them and prepared them for the rebirth of their souls and the trials they would face on their way to the “field of reeds” (paradise). She was sometimes merged with Hathor, Isis and Neith, Mut, and Nut. She was also closely related to Nephthys and Ma´at, and according to some myths was the daughter of Horus and Hathor. She was often depicted as a queen occassionally carrying a sceptre and the ankh of life. On her head she wears the sign representing the west (a semi circle on top of one long and one short pole) and a feather and or a hawk. 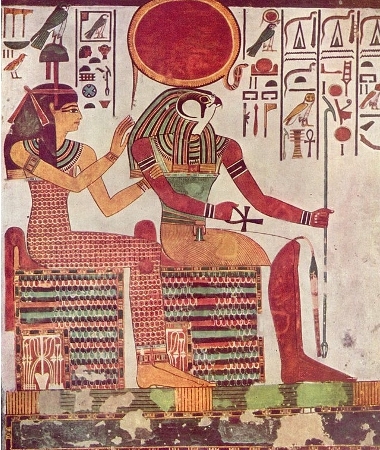 In the depictions in coffins she is often given wings, and in her association with Isis and Nepthys she was depicted as a kite. The goddess was sometimes paired with Ra–Horakthy, who represented the rising sun while she represented the setting sun. She also appears with Iabet, (the goddess of the eastern desert) in the Book of the Earth. Her main centres of worship were the western Delta, Memphis, Abydos and Luxor and Karnak.